The design of most public restrooms greatly caters for the ability to wash hands after the use of the toilette, providing facilities like sinks - sometimes with touchless faucets - soap dispensers, hand driers, paper towels etc. All quite expensive or maintenance heavy equipment. But when leaving the restroom, in too many cases the design of the facility requires you to open the door inwards usually by pulling a handle. The problem is obvious, whoever did not wash his hands after using the toilette has touched that same handle passing germs and contamination onto it. In many cases the construction of the doors really requires you to grab the handle, unlike on the way in where you can simply push the door with a shoulder or feet. Is there a reason for such design or is it modern instance of Cargo Cult? Of things you might touch, you should possibly be least worried about the exit door handle (see, Enteric Bacterial Contamination of Public Restrooms, Dr. Germ: Charles P. Gerba, etc.). But, as you say, touch-free flush, sink, and soap are often available, and urine is sterile (potentially no need to wash up anyway), leaving floor, air, and door. A representative for the [Massachusetts] Department of Public Safety told the newspaper that the state building code does not specify the direction public bathroom doors must open. Doors that swing outward allow one to exit without gripping a surface but they must be configured to avoid hitting passing hallway traffic. Doors opening into the path of egress shall not reduce the required width to less than one-half during the course of the swing. I think what you have, as with so much bad design and user experience, is convention and a lack of incentive to do the harder/more expensive thing (no law requiring it, no directive from the client, etc.). Do you think there needs to be more behind it than that? Trying to push the door forward might not be enough to clear the obstruction depending on a number of factors, primarily that when pushing on a door, most of your force is going to be distributed across the door and can't be in a focused spot for knocking over the obstruction. EDIT: I've not had much luck tracking down a direct source for this. There's a ton of information on Google for building codes -- all of it painful legalese-- and while I might find it eventually, I could also note that this doesn't have to be a building code-- it could just as well be a convention. Find a room with an outward swinging door. Lock down other exits so that they cannot be used. Locate the fresh excrement of an animal, and place it in this room. Take a younger sibling with a propensity for building things and a distaste for rancid odors, and also place him in the room. Walk outside, close the door, and place your foot at the base of the door, and lean forward to place all of your weight on that leg. Do not move. Remember, you are simulating an obstruction. When you are satisfied that the sibling is properly frustrated, move from your position and allow him to exit. Wait for the sibling to become an architect. Check to see which way the bathroom doors in his building swing. Alternatively, you can reason that either a code or convention is in place by checking several office buildings, finding all rooms which have only one entrance and are made for small capacity (larger ones usually have multiple entrances and swing outward to avoid crowd crush), and seeing which way they open. If they all invariably open inward, a code is probably in effect (If it were a matter of whim, there would be variance). If most of them open inward with a few exceptions, it may be a convention instead (though it could also be that the doors were modified after inspection). Presumably, if my above answer is the case, this won't only happen with bathrooms, but with all similar small rooms with a single entrance. I believe that in some places it is against building/fire regulations to have bathroom doors opening outwards. Rational or not, I think the reasoning is that an outward-opening door could allow for 'backdraft' if a fire were to start in the bathroom. One solution I've seen is the foot pull (see below), but those are not particularly usable either. 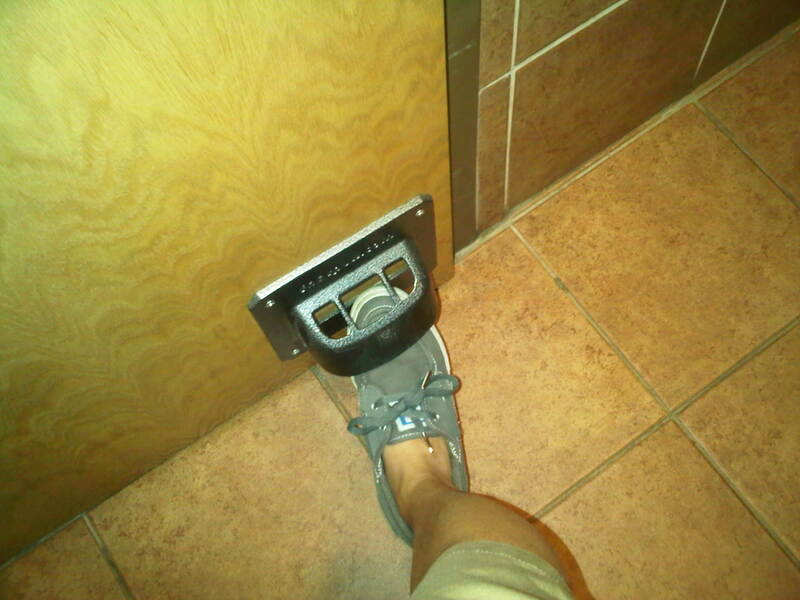 When I've used them, I've worried that someone will open the door while my foot is in there. Actually I have come across toilets in a motorway rest area that has doors that open outwards. It was a disabled toilet - one that was separated from the main restroom area, so the cubicle door was the only door. I used them occasionally when my kids were smaller and I needed to take a pushchair in with me, they have the larger maneuvering space required for wheelchairs. When I came out, I nearly knocked out several people who were passing by. "Hmmm, that's dangerous," I thought. See also Naked Gun clip on YouTube. It definitely makes sense for doors to open outwards and the associated danger for others fades into the background in comparison with a disabled person needing the loo - and more to the point, potentially getting into trouble while in the cubicle. The reason for outwards opening doors is that in an emergency the occupant may be lying on the floor. The door can also open inwards if space permits, but bearing in mind the additional need for at least a 1.5m maneuvering circle. If considering the door between the larger restroom area itself and the the outside, as opposed to the stall/cubicle doors themselves. I think generally the same principle applies. Certainly people inside a room are in the context of the facility and its purpose, whereas people outside are not necessarily in that mindset (yet) and maybe have no intention of going in but just standing chatting, waiting or passing by. People inside are rather less likely to be just standing there and more likely to be on their way out. The solution for that particular problem, (where space allows) would be to have a L-bend or U-bend corridor or similar so that there are no doors and no-one can see round the bend. You'll frequently find exactly that in places of high footfall like airports and shopping centers. Except for a special form of horizontal sliding door and a couple of other exceptions, the Life Safety Code requires doors in a means of egress to be of the side-hinged or pivoted swinging type. Further, the Code requires the swinging doors to open in the direction of egress travel under any of four conditions: One, when the door serves a room or area with an occupant load of 50 or more persons; Two, when the door is used in an exit enclosure (such as the door into an enclosed exit stair); Three, when the door serves a high hazard contents area; and Four, when the door is in a horizontal exit. If none of the four conditions applies, then the door is permitted to swing back into the room or space. The rule involving 50 people is related to a panicking crowd of people in an emergency pushing against a door that if opening inward would be impossible to open. So if the restroom area counts as one of those four methods of exit then it has to swing outwards (in the US at least). If not, then logic, space and general safety should prevail. At this point, it's obvious (and unsurprising) that there are many factors which affect whether a door should swing inwards or outwards. I'm sure that top of the list for installers are matters of safety, regulations, accountability. Consequentially matters of hygiene are lower on the list for many commercial and residential installations, but of course of high importance in medical or 'clean room' applications. Some workarounds are available like the StepNPull and similar but these are retro-fit applications and certainly not suitable for use on their own. Personally, and depending on the establishment I tend to pull the handle at a point that is least natural to others, and perhaps tend to assume that others who do the same are those that also wash their hands properly. 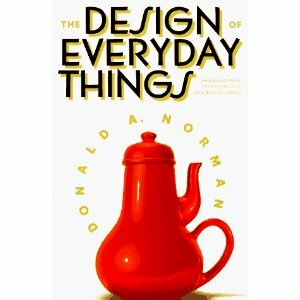 If you’re interested, there is a great book which has been around for more than twenty years discussing usability, by Professor Donald A. Norman. Norman started his usability career with a similar question like yours – why door usability is so poor. If you have the time, I would highly recommend this book, since it’s one of the “must read” books if you want to learn more on usability. And to answer your question: my view is that the restroom interior manufacturers and designers don’t manufacture doors and vice versa. Probably there’s not a strong enough project manager having hygienic design close to heart - instead the main focus is (1) budget and (2) delivery on time. There could also be a third option, which is similar to when you take your first programming learning skills. Presume that everything goes right, instead of focusing on when things go wrong. In this case – if everyone washed their hands appropriately, this would not be a problem. Ref: The Design of Everyday things. public doors => open outdoor to facilitate the exit in case of fire or other emergencies. The rest should open in a way to obstruct the least the traffic and to prevent accidents. I've seen one very nice solution to this problem in Japan: In Tokyo, even some public toilets have automatic doors. A different solution to the problem is used in public toilets in the Amsterdam Airport (Schiphol): They've simply don't use any doors, and rather have a bit twisted entrance for privacy. Make the door smaller in height, so it doesn't touch the floor, and leaves enough room for a foot to pull it. If for any reason that can't be done, then place something floor size (at the door), so you can pull it with a foot. 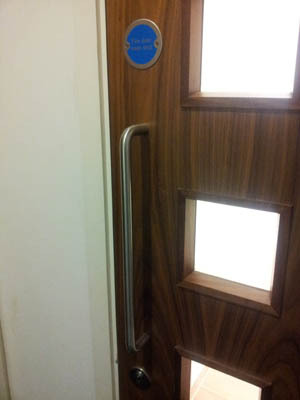 Or even if that isn't possible, maybe a door handle that you can grab/knock with an elbow (so not touching with a hand). Or, a way to push the door, and with a spring, it returns to you open. (Some people may think this topic is for the paranoid or ultra-hygienic people, but trust me, many people don't wash their hands). If a door opens outwards, especially in a crowded restroom, then there is a high risk of someone who is walking by getting hit with the opening door. As such the risk and liability for the organization of getting sued is greater. To mitigate that risk, the doors open inwards. In some areas this has been lobbied and turned into building codes. There is also the space factor where opening outward takes up more space as they require room to move around an open door. Both of which come down to money. Too expensive to get sued, too expensive to make the room bigger to accommodate outward swinging doors. In general, I have found that when entering a room, doors open inwards. It's not just restrooms. Likely for the safety reasons issued. If I'm leaving a room, I'm aware of the door, it's what I'm walking towards, and looking at. If it suddenly opens towards me, I'm more likely to see and react. If the doors opened outwards, it definitely wouldn't affect me. However, if I'm disabled, there is a chance that I could fall against an inward swinging door, which is why most disabled restrooms have outward swinging doors, because a person outside might REQUIRE access to the room which is otherwise blocked. And if the room is small, opening the door with a wheelchair would be challenging if it swung inwards. If I'm in the hall and not entering the room, I'm not paying attention to the door. It swinging open will catch me off guard, potentially causing injury. Which is why doors open inwards normally. If I'm in the hall and entering the room, it doesn't really matter which way the door goes. But, in the sake of a disabled person in a wheelchair, opening outwards is again, preferred, as there is probably MORE space outside the room, than inside making maneuvering and opening the door easier. Roger's pretty much hit on the head with his answer,from an usability point of view its easier for someone who is in a wheelchair to push in the door (hence it opening inward). Similarly when people are exiting from inside,they could invariably knock someone on their nose if the door opened out outside. However from a disabled person point of view,I am just wondering how effective it is for a disabled person to maneuver with a door which swings inside when you are inside a small cramped place like a public toilet. The wind blows inwards when the door opens inwards. This helps fresh air to go inside the restroom and not let the bad air to come outside. When you open outwards the bad air comes out, This is the same principle followed in labs as he said. As others have said, I think the core reason is that there is a great danger of knocking someone over when opening the doors if, as is often the case, the entire area is compact. Also, in most public areas, where there are doors that are usable both ways, it is common to have a window, so that you can see whether someone is coming the other way. Obviously, this would not be appropriate in this case, so opening inwards makes sense. I have seen at least one place where most cubicles open inwards, but the disabled one opened outwards, which is sensible. The risks of knocking someone over are still there, but only from one door, the accisibility is increased significantly. The other reason that it can make sense is that if doors are left open, when they open inwards, they are not a problem, but if they open outwards, they would be a danger. Including door closers makes it harder to know if a cubicle is occupied, and the construction of the cubicles is often not up to ensuring they swing shut on their own. In simple sense , i feel it is because it is more easier to push then pull n as it is for public , public convenience is more important. I actually refer to banks and other such places where public should feel comfortable with all the services. With a toilet there are cases where you want to be able to get into the toilet as fast as possible. Getting out of the toilet as fast as possible isn't as important. It takes less time to get into the toilet if the door opens inwards. As far as I understand the cases where doors are regulated to open outwards is when it's in the interest to be able to evacuate the building as fast as possible. It makes sense to have doors open in the direction towards which speed is more important.